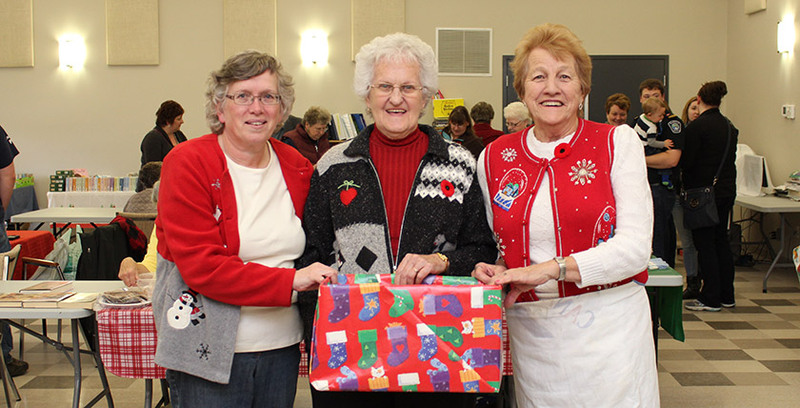 Blackville Women’s Institute members Doreen Stewart, Lois Corney and Joan Underhill at their annual Christmas Craft Sale. I will speak on Legacy which means something handed down. I have in my hand a book entitled Fifty Years of Women’s Institute in New Brunswick. This was handed down by Mrs. Jessie (Clever) Morehouse, a very dedicated member. Many may think the Women’s Institute is a group of women holding a meeting every month to have a chat. This is not so. This organization or gathering was first started February 11, 1897, which is why we celebrate February as our birthday month. A young mother in Stoney Creek, Ontario, after the death of her first born son from drinking impure milk, was compelled to save other women from such a heartbreak by studying the principles underlying healthful nutrition and to pass them on to the local women. This is how the sterilization of milk began. One hundred and one (101) women and one man attended her first meeting. That young mother, Adelaide Hoodless, never dreamed that 3300 Canadian Branches with a membership of 90,000 from PEI to the Yukon would later exist. Also, that a golden chain of Institutes would be formed around the world. Even Queen Mary was President of her Branch and other Queens have followed in her footsteps to this day. Today you can visit “The Adelaide Hoodless Home” in Stoney Creek, Ontario. Now, coming back to New Brunswick’s first Institute, it was started in Andover, NB in 1911 with 40 ladies in attendance. There were no cars or paved highways so they travelled by horse and buggy. At that time women had NO VOTE and were not encouraged to hang about when men were talking “Politics”. Mrs. James Porter organized the first meeting as her husband was an MLA and a business man who travelled around the country. She often accompanied him to meetings but sat outside tending the horse. Women would often come to speak with her as they lived in out of the way places and were lonely, so they often unburdened their troubles on her. On one of their trips to Ontario and Quebec, she learned of the great benefits women were receiving from the Women’s Institute. So, that is how and why she organized a Branch in Andover. From these meetings they learned cooking, sewing and other skills. They lobbied the New Brunswick Provincial Government for a sidewalk through the village; a bridge across the St. John River between Perth and Andover; a drinking fountain for the school; an oil stove; books; Christmas treats, and more. Centre Napan was the second Women’s Insitutute in June 1911. Then, in 1918 the Acadians formed an organization. During the Fall/Winter of 1918 -1919, all Women’s Institutes were called upon to fight the Flu Epidemic. The women were enlisted as nurses and helpers providing special diets, etc. During World War 11 they wound bandages, knit socks, made quilts and sent parcels to soldiers overseas. The Blackville Women’s Institute was organized on October 28th, 1931 with Mrs. Burt Underhill as President. Today, the W. I. is still active with eleven members. We meet the 2nd Tuesday of the month at 10:00 am except July and August. We donate to the Cancer Society, Fireman’s July Parade, Children’s treats for the Santa Clause Parade, Terry Fox Campaign, Food Bank, Transition House, Pennies for Friendship and more. We also give scholarships to one or two Blackville High School graduates as well as to a Granddaughter or Grandson of one our members. We send delegates to the ACWW meeting in April and to the District and Provincial Conventions and we attend one of the Rogersville meetings and invite them to our February Birthday Luncheon Meeting. 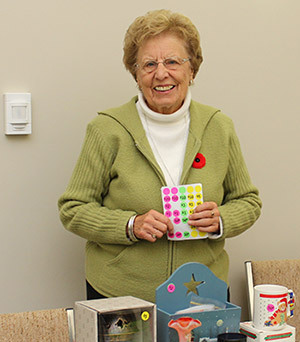 We contribute to the New Brunswick Women’s Institute Home for Seniors in Woodstock. One of our local WI members, Mrs. Dorothy (Arthur) Dunphy is now a resident there. In November we lay a Remembrance Cross at the graveside of a veteran, most times one who has no relatives living here. Perhaps you wonder how 11 members get the money to support all these groups and organizations. Selling tickets on our Fund Raiser Quilt. Lillian Brennan, Past President and the one who looks after the quilting projects. Lois Comey, Director, International Affairs Convenor -keeps us informed of the Refugee situation. Margie Mountain, Director, Canadian Industries & Environment Convenor. Daphne Jardine, Citizenship/Legislation/Unity Convenor and a quilter. Sylvia Burns, Works full time but helps when called upon. Joan Underhill, Community Affair Convenor. Keep us up-to-date on the sick, and new families to the community. Lois Vickers, Education Convenor. She has given us a very interesting report on our local school. Carrie Weaver, Home Economics/Unity Convenor. She comes down from Doaktown to our meetings and is always making articles for our exhibits and for hospital patients. At one time we had 23 branches in Northumberland County and it’s sad to say many Branches have folded. Today we have three — Red Bank, Burnt Church and Blackville. We are always open to new members. 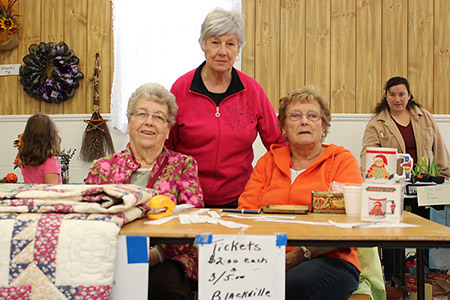 If you are interested in joining the Blackville Women’s Institute and being part of this organization that has remained active locally for 85 years, contact Eleanor Donald, secretary at (506) 843-6100.